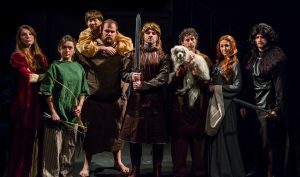 GAME OF THRONES-The Musical is rocking the Macha Theatre, garnering rave reviews. 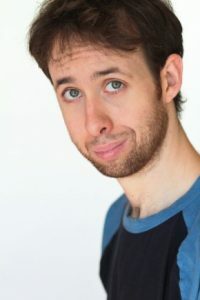 Co-written, Co-Produced and Directed by STEPHEN CHRISTOPHER PARKER, he is an actor with credits in a slew of hit movies including Juno, Rebound, Blades of Glory and Little Miss Sunshine. Parker also had substantial roles on prime-time television in shows such as ER, Rizzoli and Isles, Fish Hooks and 90210. 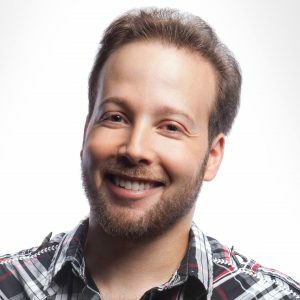 His Co-Writer and Co-Producer, STEVEN BRANDON, hails from Australia where he was a successful theater producer in Sydney, starring in and directing productions of I Love You, You’re Perfect, Now Change, and Urinetown: The Musical. With his company Canned Laughter, Steven produced productions of Rent, Lend Me A Tenor, Closer, and Noises Off. Soon after moving to L.A. Brandon and his writing partner sold a single-camera comedy pilot titled, Single Girl Theory to ABC Family and were staffed on the CBS sitcom Friend Me. Hollywood Revealed: Hi, guys. Congrats on the success of Game of Thrones, the musical. HR: How did you decide to do this particular show? Steven Parker: It’s been two years since we produced “Lost – The Musical” and Brandon and I thought it was time to step up to the plate again. Steven Brandon: Parker always had a passion for Game of Thrones. The TV series is currently at the height of its popularity. I was not yet a convert and had to sit down and binge all sixty episodes to get acquainted with the show. HR: How did the two of you meet? Steven Brandon: At the wrap party for the final episode of ER. Parker was a recurring guest star on the show and I happened to be working on the Warner Bros. lot. I had previously seen Parker in a short film directed by my cousin and after saying hello we became instant friends. HR: Tell us about the music for GOT. Who wrote it? Steven Parker: When we decided that we would do original music we knew we would have to team up the other people. We are not the most musically inclined but we did write the lyrics and teamed up with ERIN STEGEMAN and ACE MARRERO, whom we know from their show, “Once Upon a Time: The Rock Opera.” Erin and Ace came on board as our musical producers and directors and really knocked it out of the park, turning in catchy rock ‘n’ roll versions of all of our songs. HR: You have thirty cast members in your production and you doubled down by hiring two separate groups of actors who alternate the roles. How hard was that? Steven Brandon: Casting went pretty well. A number of actors knew of our reputation from other shows, such as “Lost-The Musical, and we got a lot of strong candidates walking through the door. Steven Parker: Knowing that we could pick two actors for each role saved a lot of arguing and dicussion because they were a lot of people that we liked and wanted in the show. HR: What about the role of Tyrion? Did you try to get an actual little person to play Tyrion Lannister? Steven Brandon: At first we did and we met with a few of them but they were not musical theater trained or ready. A lot of great actors and comedians came in to read but they were not the best of singers. Steven Parker: Plus they are all constantly working and could not commit to the length of our run. 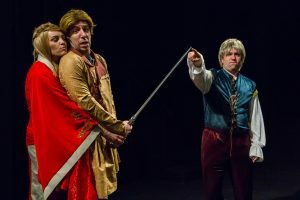 Steven Brandon: We ended up finding BRAD SIMANSKI and DREW BOUDREAU, both 5 feet tall, who are fantastic and do their job perfectly in their show stopping number. HR: Did the cast contribute to the material in any way? Steven Parker: Both casts are super talented and bring so much extra to their roles. The character of Jon Snow is picked on quite a lot in the show and the different reactions from MAX REED and ZACK KANNER are priceless. Steven Brandon: During the second act the Lannister’s get together and really pour it on thick. The cast decided themselves to put on dark make up and glam outfits and become the “Glamisters.” It was not in the script but it became a brilliant addition to the show. HR: What is next for GOT musical? 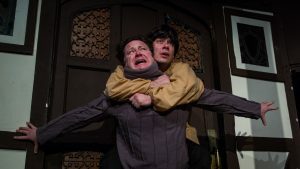 Steven Parker: We are still performing for the next five weeks at the Macha theater in West Hollywood. After that we take a small break and then head to San Diego for Comic Con to do shows from July 20-22! 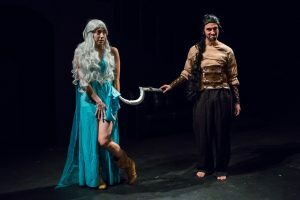 HR: Why is THIS the GOT show to see in L.A? Steven Brandon: The TV series does not come back on the air until July 16. We have the perfect refresher course with our show as we start from the beginning and tell the story in order ,parodying season one, book one. 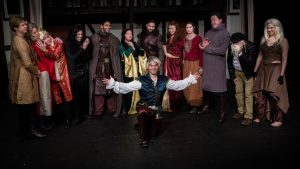 Steven Parker: This will definitely wet your appetite for the return of the TV show and is a great introduction to fans of musical theater who have not seen “Game of Thrones” would like to know what it’s all about. Steven Brandon: Plus we are the only Game of Thrones musical in town with an actual throne! HR: You also have a Soundtrack? HR: Nice! Any ticket discounts? Steven Parker: For readers of Hollywood Revealed, you can type in the coupon code “sword” at checkout to receive a 15% discount off tickets. HR: That’s very generous, guys. Thank you for taking the time to talk to us and wishing you continued success. When: Running now through April 16th at 8:00 pm. Fridays at 8pm, Saturdays at 4pm and 8pm, Sundays at 7pm.